Bring power safely and conveniently to wherever you need it with a full line of Plug-In Outlet Center Units from Wiremold / Legrand. These units are ideal for use in a wide variety of settings, including relay racks and cabinets, laboratories, workshops, classrooms and offices. Plug-In Outlet Center Units include rack mount, Cabinet-MATE, compact, 90 degree, deluxe control, industrial, and international units. Most units are available in both 15 and 20 Amp configurations. 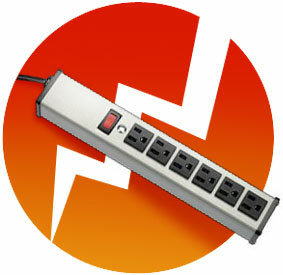 Wiremold / Legrand also offers extensive custom capabilities for Plug-In Outlet Center Units. Contact the factory for more information. User-ready outlets. Plug-In Outlet Center units provide power distribution in a portable, plug-in unit. Rugged construction. Durable 2" x 1 3/4" [44mm x 51mm] or 3 1/2" x 2" [89mm x 44mm] aluminum housing. Some Plug-In Outlet Center units are available with an impact resistant plastic housing. Space saving. Rack mount units fit standard 19" [482mm] relay racks. Compact 1U design takes up minimum space. 23" [584mm] units available, consult factory. Low profile. CabinetMATE units offer a narrow 1 1/2" x 1 3/16" [38mm x 20mm] aluminum housing. Aesthetically pleasing. Rack mount units have a black matte finish and a black cord. CabinetMATE, compact and industrial units have a gray finish and a black cord. Deluxe control and 20A units have a putty white finish and a black cord. Most units with a putty white finish have a putty white cord. Special Use units have a white finish and a white cord. Each unit features one of four different mounting types. Each mounting method has been designed to optimize the performance of the product. Complete mounting hardware and installation instructions are included with every unit. Cord properly rated to load requirements. 15A units have a 14/3 SJT cord and a NEMA 5-15P plug. 20A units have a 12/3 SJT cord and a NEMA 5-20P or NEMA L5-20P plug. Lighted switch. Most units have lighted on/off switch(es) to control power to the unit. Resettable circuit breaker. Provides overload protection. UL and cUL Listed or Recognized. Units are UL and cUL Listed to UL1363 standards. Rack mount units are UL and cUL Recognized to UL1363 standards. 15' Six front outlets, lighted switch. 6' [1.8m] or 15' [4.6m] cord. Receptacle center-to-center 1 1/2" [38mm]. 15' Six front outlets, lighted switch. Receptacles rotated 90°. 6' [1.8m] or 15' [4.6m] cord. Receptacle center-to-center 1 1/2" [38mm]. 15' Two front, four rear outlets. Lighted switch. 6' [1.8m] or 15' [4.6m] cord. Receptacle center-to-center 1 1/2" [38mm]. 15' Six 20A front outlets, on/off switch. 6' [1.8m] or 15' [4.6m] cord. Receptacle center-to- center 1 1/2" [38mm]. 15' Six 20A front outlets. 6' [1.8m] or 15' [4.6m] cord. Receptacle center-to-center 1 1/2" [38mm]. J06B0B20X-AM - Digital LCD readout of current draw. Six 20A rear outlets. 6' [1.8m] cord. Receptacle center -to- center 1 1/2"[38mm]. 15' Ten outlets. 6' [1.8m] or 15' [4.6m] cord. Length 48" [1.2m]. Receptacle center-to-center 4" [102mm]. 15' Eleven outlets. 6' [1.8m] or 15' [4.6m] cord. Length 70" [1.8m]. Receptacle center-to-center 6" [152mm]. 15' Twelve outlets. 6' [1.8m] or 15' [4.6m] cord. Length 77" [2m]. Receptacle center-to-center 6" [152mm]. Eight 20A outlets with t-slots. 6' [1.8m] or 15' [4.6m] cord. Length 20" [508mm]. Receptacle center-to-center 1 1/4" [32mm]. Units available with straight blade or NEMA L5-20P locking plug. Ten 20A outlets with t-slots. 6' [1.8m] or 15' [4.6m] cord. Length 48" [1.2m]. Receptacle center-to-center 4" [102mm]. Units available with straight blade or NEMA L5-20P locking plug. Eleven 20A outlets with t-slots. 6' [1.8m] or 15' [4.6m] cord. Length 70" [1.6m]. Receptacle center-to-center 6" [152mm]. Units available with straight blade or NEMA L5-20P locking plug. Twelve 20A outlets with. t-slots. 6' [1.8m] or 15' [4.6m] cord. Length 77" [2m]. Receptacle center-to-center 6" [152mm]. Units available with straight blade or NEMA L5-20P locking plug. 15' Six outlets, lighted switch. 6' [1.8m] or 15' [4.6m] cord. Length 12 1/4" [311mm]. Receptacle center-tocenter 1 1/4" [32mm]. 15' Eight outlets, lighted switch. 6' [1.8m] or 15' [4.6m] cord. Length 15" [381mm]. Receptacle center-tocenter 1 1/4" [32mm]. 15' Ten outlets, lighted switch.Putty white finish. 6' [1.8m] or 15' [4.6m] cord. Length 13" [330mm]. Width 3 1/2" [89mm]. Receptacle center-tocenter 1 15/16" [49mm]. 15' Four outlets. Receptacles rotated 90° and spaced to accommodate transformers. 6' [1.8m] or 15' [4.6m] cord. Length 16" [406mm]. Receptacle center-to-center 3" [76mm]. 15' Six outlets, lighted switch.Putty white finish, 6' [1.8m] or 15' [4.6m] cord. Length 12 1/4" [311mm]. Receptacle center-tocenter 1 1/4" [32mm]. 15' Six outlets, lighted switch.Putty white finish, plastic housing. 6' [1.8m] or 15' [4.6m] cord. Length 12" [305mm]. Receptacle center-tocenter 1 1/4" [32mm]. 15' Four 20A, 120V, 60Hz 2500 watt outlets. Lighted switch, putty white finish. 6' [1.8m] or 15' [4.6m] cord. Length 10 3/4" [273mm]. Receptacle center-to-center 1 1/2" [38mm]. 15' Six 20A, 120V, 60Hz 2500 watt outlets. Lighted switch, putty white finish. 6' [1.8m] or 15' [4.6m] cord. Length 13 1/4" [337mm]. Receptacle center-to-center 1 1/2" [38mm]. 15' Eight outlets, lighted switch. 6' [1.8m] or 15' [4.6m] cord. Length 24" [609mm]. Receptacle center-to-center 2" [51mm]. 15' Eight outlets, lighted switch. 6' [1.8m] or 15' [4.6m] cord. Length 48" [1220mm]. Receptacle center-to-center 5 1/4" [133mm]. 15' Sixteen outlets, lighted switch. 6' [1.8m] or 15' [4.6m] cord. Length 48" [1220mm]. Receptacle center-to-center 2 1/2" [64mm]. 15' Eight outlets, 6' [1.8m] or 15' [4.6m] cord. Length 48" [1220mm]. Receptacle center-tocenter 5 1/4" [133mm]. 15' Sixteen outlets, 6' [1.8m] or 15' [4.6m] cord. Length 48" [1220mm]. Receptacle center-tocenter 2 1/2" [64mm]. 15' Twelve outlets, 6' [1.8m] or 15' [4.6m] cord. Length 72" [1830mm]. Receptacle center-to-center 5 1/4" [133mm]. 15' Twenty-four outlets, 6' [1.8m] or 15' [4.6m] cord. Length 72" [1830mm]. Receptacle center-to-center 2 1/2" [64mm]. 15' Twelve outlets, lighted switch. 6' [1.8m] or 15' [4.6m] cord. Length 72" [1830mm]. Receptacle center-to-center 5 1/4" [133mm]. 15' Twenty-four outlets, lighted switch. 6' [1.8m] or 15' [4.6m] cord. Length 72" [1830mm]. Receptacle center-to-center 2 1/2" [64mm]. IEC5 Five 250V, IEC 320 outlets. Gray finish. 10A single pole circuit breaker. Power cord not included. Length 11" [279mm]. Receptacle center-to-center 1 1/2" [38mm]. TÜV and UL1950 Information Technology Listed. 15' Four outlets, white finish. 6' [1.8m] or 15' [4.6m] cord. Length 10 3/4" [237mm]. Receptacle center-to-center 1 1/2" [38mm]. cTUVus Listed as Medical Electrical Equipment. Suitable for use where Article 517 of the NEC requires Hospital Grade Outlets. 15' Six outlets, white finish. 6' [1.8m] or 15' [4.6m] cord. Length 13 1/4" [337mm]. Receptacle center-to-center 1 1/2" [38mm]. cTUVus Listed as Medical Electrical Equipment. Suitable for use where Article 517 of the NEC requires Hospital Grade Outlets. 15' Four outlets, white finish. 6' [1.8m] or 15' [4.6m] cord. Length 10 3/4" [237mm]. Receptacle center-to-center 1 1/2" [38mm]. Not for use where Article 517 of the NEC requires Hospital Grade Outlets. 15' Six outlets, white finish. 6' [1.8m] or 15' [4.6m] cord. Length 13 1/4" [337mm]. Receptacle center-to-center 1 1/2" [38mm]. Not for use where Article 517 of the NEC requires Hospital Grade Outlets. Not for use in general care or critical care environments. 15' Four individually switched outlets. Lighted on/off switch. Putty white finish. 6' [1.8m] or 15' [4.6m] cord. Length 7 1/2" [191mm]. Width 3 1/2" [89mm]. Receptacle center-to-center 1 15/16" [33mm]. 15' Eight individually switched outlets. Lighted on/off switch. Putty white finish. 6' [1.8m] or 15' [4.6m] cord. Length 13" [330mm]. Width 3 1/2" [89mm]. Receptacle center-to-center 1 15/16" [33mm]. 15' Four individually switched outlets. Lighted on/off switch. Gray finish. 6' [1.8m] or 15' [4.6m] cord. Length 13" [330mm]. Width 2" [51mm]. Receptacle center-to-center 2 1/8" [54mm].